Our stature as an industry leader has led to an invitation as a founding council member of the International Hydrogen Fuel Cell Association (IHFCA). Started by the China Society of Automotive Engineers, the IHFCA integrates resources across the entire hydrogen fuel cell industry chain to create an international platform to promote global fuel cell technology advancement and commercialization, and foster scalable applications. 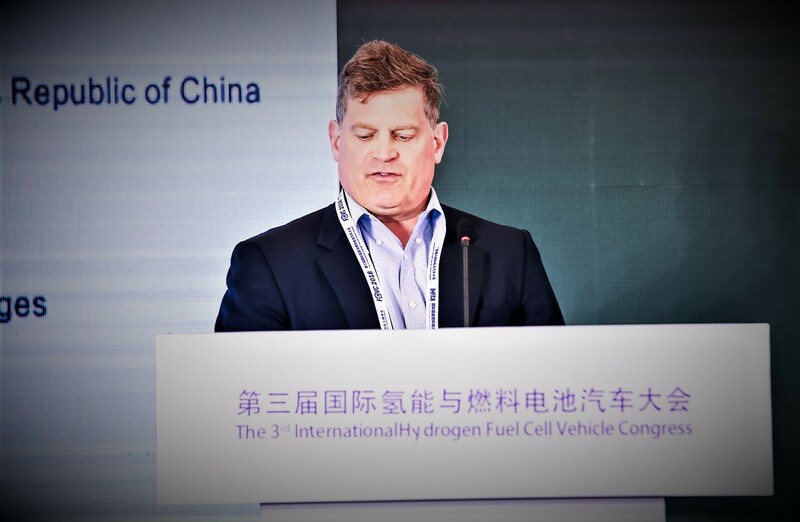 Our first act as council member occurred in October when our president and CEO Jon Taylor served as opening speaker at the International Hydrogen Fuel Cell Vehicle Congress in Rugao, China. This premier event connects hydrogen fuel cell technology developers, fuel cell automakers, investors and government policymakers to foster global collaboration across the entire industry to accelerate commercialization. Since its inaugural event in 2016, the annual Congress has grown in influence, and continues to bring in more global business leaders and technology developers within the sustainable transportation space. Jon’s presentation, “The Rise of Zero Emissions, Heavy-Duty Fuel Cell Engines through OEM Participation and Partnership,” featured Nuvera’s fuel cell engine, and showed how the company’s distinctive technology platform is disrupting the future of mobility. In fact, Nuvera has always been about mobility; we have generations of motive fuel cell products to prove it. Throughout his presentation, Jon emphasized the importance of OEM participation for fuel cell vehicle adoption. He also walked attendees through Nuvera’s fuel cell innovation, manufacturing capabilities, and trends in clean transportation that help make hydrogen make sense as an energy source. As demand for zero-emissions transportation continues to grow, so will our voice and our industry. We believe that with fuel cell mobility, the future is uncompromising. With Nuvera fuel cell engines, the possibilities are limitless.